The other day I played a couple of rounds of Starcraft against my brother with random teams on random maps new to us both. This is a variant that increases the value of information and the importance of scouting as high as we can push it, which makes for some very interesting games full of deceit and cunning. Tools such as denial of map information, a form of containment, suddenly becomes viable as the other contestant doesn't know what's out there. If you can dissuade your competitor from exploring a certain area then he or she might miss an excellent expansion or a key defensive point for long enough that you may exploit it first. For example, on one of the maps we played I discovered very late that I had a semi-hidden third entrance to the base, which I had left completely undefended. Shrouded in shadows the scenery suggested that there was nothing there and so I didn't prioritise the exploration of that area until late in the game. Fortunately for me I had managed to keep my opponent busy through needling attacks on one his expansions, so he didn't have time to capitalise on my mistake. In the end, I had to give up that game for lost as the results of my appalling macro skills reared it's ugly hydra-like head. The first map we played was a small 2 player map on which there was no easily found natural expansion. I was lucky enough to get protoss as my team and quickly got some zealots over to an easily defended ramp where I also smacked up a shield battery and later on a photon cannon for detection. When my probe encountered purple creep the fact lay clear to the day (or the dusk, as we played in the evening): My brother is a zerg! I should have realised this from the sounds he made earlier in the day and the size of his fangs, but I guess I've become used to it. Knowing what I had in front of me I went for some dragoons while reaching for corsairs to harass his overlords. Remember: none of us knew the map we were playing so denying him the scouting from his overlords could be vital. After having a few skirmishes zergling vs. zealot I gathered a few dragoons to make a push while at the same time annexing that far away "natural" expansion. This turned out to be a good move as I found a budding hatchery in the mirror position, and lightly defended at that. Knowing that this would grab my brothers attention I attempted to cut of his reinforcements with a second team of mixed zealots and dragoons, but they never got to their intended position as my first team desperately needed help. Outnumbered, my brave soldiers managed to dance around enough, through my microing, to ensure the destruction of the horrific zerg outpost whilst the reinforcements strove to join the fun. At this point I realised that I didn't have any observers. As the thought registered in my brain, spikes started shooting up out of the ground, throwing my ranks into disarray. You can't fight what you can't see. With none of the infrastructure in place to build the little blighters I quickly set a probe on construction duty and at the same time ordered up another gateway to up production of zealots and dragoons. 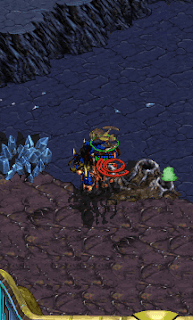 On the front line my brother tried baiting my brave blue-skins to advance, no doubt to lure them into a trap. Keeping a firm leach on my fervent zealots I dashed in and out with my dragoons instead, managing to take out a few hydralisks and zerglings. When finally I got a reaver and some probes out, queens and a landing party came out of nowhere, destroyed a mining expansion! I quickly rallied what troops I had roaming the country-side and punished this intrusion (or extrusion rather). At this point I had a good containment of the zerg and went in with everything I had. 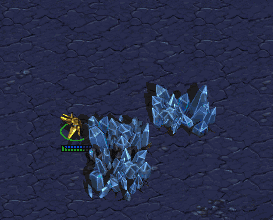 In a reckless assault, where micro got lost along the road of macroing in all the troops, the last zerg base finally fell and victory was mine. It was great fun to add an exploration element to the game. As mentioned, scouting and denial of information became very important. Not knowing where the good first expansions were did perplex both me and my brother and things such as not scouting my own base properly could potentially have lost me the game. In games of this variant there is definitely room for tactics beyond what's normally used and a greater possibility for playing mind games. Although many veterans will find that there aren't many good maps around that they haven't played, it could be worth finding one and trying it "blind" with a friend (or an enemy). There are some great games in store for those brave enough to take a step into the unknown. There's a really good story in the mill at the moment on a gaming group called Realms Beyond. Be sure to come back later in the week; I think you'll enjoy it.